To celebrate the 10-year anniversary of his cookbook Crave, the JBA-nominated chef weighs in on L.A. vs. NYC's dining scenes, and why we should all be eating with our hands. 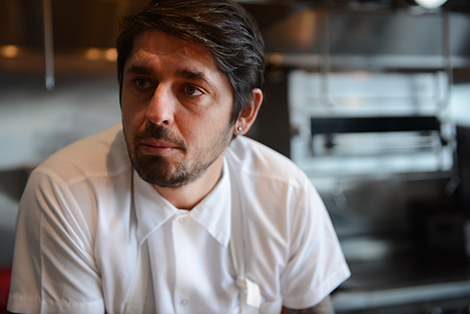 From spearheading a pop-up revolution with his mobile operation LudoBites, to his recent James Beard nomination for the bistro-inspired Petit Trois, chef Ludo Lefebvre has always been two-steps ahead of the national curve, while helping to mold L.A.’s culinary landscape. This year marks the 10-year anniversary of his groundbreaking cookbook, Crave: The Feast of Five Senses, which, in many ways, still remains the foundation for this trailblazing chef. 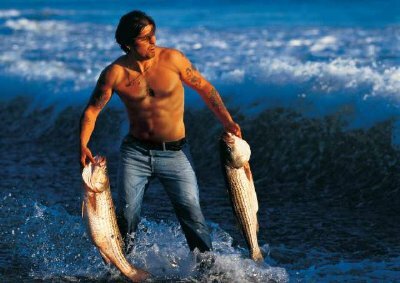 The book’s freshly updated edition (yes, with the shirtless picture still intact) honors its decade of influence and critical role in the modern cookbook cannon. To celebrate the occasion, we asked Lefebvre to reflect on what’s changed in the restaurant scene since Crave first came out. Find out why he thinks L.A.’s dining scene is more vibrant than New York’s, his thoughts of eating with your hands, and whether or not he has plans to expand outside of Los Angeles. Crave was written during your time at L’Orangerie, arguably the greatest French restaurant in L.A. history. How did this influence Crave? Crave came out in 2005, but I started writing it in 2002 during my time at L’Orangerie. It was such a high-end French restaurant and very classic like the way I learned how to cook in France. My mind was a little more classic at the time. It’s 2015 now and I grew up—I’m using a lot of new flavors, but I’m still using the same techniques as a foundation. How did opening LudoBites free your mind creatively? All my life I worked in these French, high-end restaurants, and when I started to do LudoBites I felt like I had more freedom—Los Angeles really gave me freedom. I wasn’t in this white jacket anymore, or worried about critique, or worried about the staff. It’s pressure in a high-end restaurant. It’s pressure for customers, but also to be on top. LudoBites was less pressure because it was more about me. For the first time in my life, I was alone. I was very happy, and I guess that’s why I cooked better and why my dishes were more interesting. What was the dish you felt like represented your vision at LudoBites? There were so many dishes, but I did a foie gras croque monsieur and no one was really thinking about that at the time. It was a classic, using a high end ingredient in a fun way. Normally, you eat foie gras with silverware and crystal glasses, but at LudoBites you just ate it with your hands. My approach with classic food is to make it less frou-frou. How has restaurant culture changed since when this book first came out? Chefs really are focusing now more on ingredients. They really care about what they put on the plate. That’s changed a lot. Fine dining is gone. It’s coming back a little bit, but true fine dining has been gone the past five, ten years. Classic French food is coming back more and more. Food is like fashion. You always have a new color, a new design. Five years ago it was all about Spanish food. Now it’s gone, no more. We have all this movement about Scandinavian cuisine and foraging. The now-legendary shirtless Ludo photo from Crave. What is the scene in France today? Are more people straying from tradition? Things have changed a lot in Paris. Young, talented chefs are very accessible to people. They want to have fun and cook good food in a refined ambiance: not too frou-frou, not too casual. There are a lot of great restaurants happening in Paris right now. Do you think if you were coming up right now you would’ve stayed in Paris or come to L.A.? Oh no, I still would’ve come to L.A. I love to go to France but I’d come back here. In France, it’s true, we have amazing ingredients. I see the difference when I go back to cook over there. France has amazing terroir. Our land gives us good produce and meat and fish. America is changing but it’s not yet like France, I don’t think. Would you ever expand to a restaurant outside of L.A.? I don’t want to say never, but I don’t want to do a restaurant outside of Los Angeles yet. It’s so big! It’s a big city. There’s so much space with lots of different areas. Since Crave came out, there are a lot of spaces that were around that are now gone, and a lot of young, talented chefs who arrived. The food is really alive. There are so many different cultures. L.A. is more exciting than New York, I think, because our culture is so much bigger than New York. New York has amazing food and amazing service, but you have to dress for it. It’s a totally different lifestyle than L.A., where restaurants are more accessible, creative, and fun. L.A. has a lot of things going on here, and California has the best produce is America. Our land is amazing. You talk about how you’ve re-plated dishes for this 10th anniversary edition. What makes these recipes still relevant? It’s still all about ingredients, technique, and flavor. You don’t cook a tomato in December. It’s about the farmers market and fresh ingredients because that’s how my chef taught me to cook in France. Crave is really the foundation of cooking for me. For example, now at Petit Trois [2015 James Beard finalist for Best New Restaurant], I’m doing a napoleon from Crave. The quality of photography has really changed over the years [for cookbooks], too, that’s one big difference. It’s more beautiful and less expensive. How has being a father changed the way you approach cooking, if at all? I love your son’s IG account. Definitely. To be a father now, I’m more calm in my life. I want to watch my kids eating and touching the food. It’s changed my approach about food. I think we don’t eat enough with our hands in restaurants. I love to watch my kids touching the food with their fingers. I care about what my kids eat, so I really want to be more involved in what we eat in America. I’m worried about GMOs because I have kids now. We better take care of our kids and teach them to eat good food. Chefs now need to educate little people, too, about what is going on with the land.